Melissa Mark-Viverito currently serves as a New York City Council Member, representing District 8, which includes El Barrio/East Harlem, Manhattan Valley and Mott Haven. She was born and raised in San Juan, Puerto Rico and attended Columbia College at Columbia University in New York City where she earned her B.A. in Political Science in 1991. Melissa was selected to attend the National Urban Fellows Program and earned her Master of Public Administration from Baruch College, City University of New York in 1995. In 2005, Melissa became the first Puerto Rican woman and Latina elected to serve as Council Member for the 8th Council District. In 2009, she was elected to her second term in the City Council. 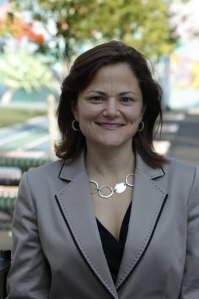 She currently serves as Chair of the City Council’s Parks & Recreation Committee and Co-Chair of the Council’s Progressive Caucus. She previously served as Co-Vice Chair of the Black, Latino and Asian Caucus. In her current capacity as Council Member, Melissa has worked to advance an agenda focused on issues affecting working class and low-income families, youth, seniors and immigrant communities. In particular, she has been a staunch advocate for the creation and preservation of income-targeted housing and for our city’s public housing program. She has also spearheaded several initiatives to address local community issues including the city’s first Age Improvement District in East Harlem as well as task forces on youth violence and displacement. Legislatively, Melissa has served as the primary sponsor of some key legislation that has been signed into law, covering topics including tenants’ rights, building inspections, local representation on parks conservancy boards and the publication of statistics on domestic violence and hate crimes. Prior to her election, Melissa worked as Strategic Organizer for 1199 SEIU United Healthcare Worker’s East, Director of the Hispanic Education and Legal Fund (HELF), and as Deputy Director of ASPIRA of New York. She also worked for the Census Bureau in 2000 and volunteered for the presidential campaigns of Howard Dean and John Kerry in 2004. Besides her professional life, Melissa has been very active in community affairs. She is a founding member of Women of El Barrio—an organization that promotes the development of women as leaders in the economic, political and social life of their community. She also served as a member of both Community Board 11 and Community Board 2 in Manhattan.